They say that third time's a charm. And charming indeed is my third time participating in Vistana Penang's annual Ramadan preview. Held in the Grand Ballroom, the dining area is arranged in banquet-style setting. Meanwhile the buffet spread is located just outside the ballroom. 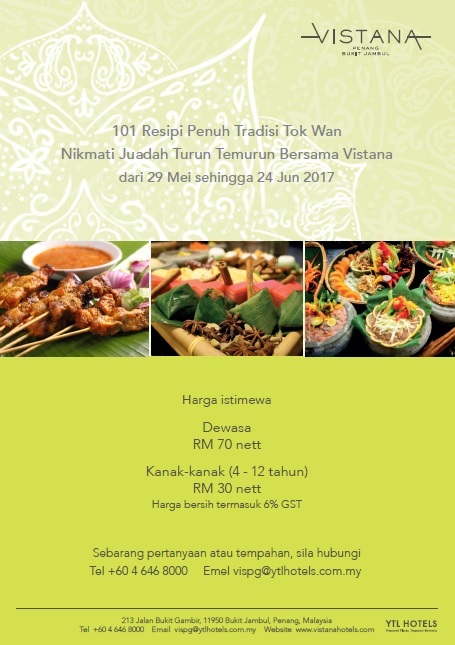 Keeping the tradition of previous years, the theme of Vistana's buffet is "101 Resipi Penuh Tradisi Tok Wan". This underscores Vistana's focus on authentic Malay cuisine. Despite having 101 items on the menu, Muslims customarily break fast with kurma (pitted palm dates). According to legend, Prophet Muhammad broke his fast by taking three dates. To warm up the palate, a hot bowl of Sup Kambing Rempah (Spiced Mutton Soup) is a sound choice. The soup is stewed with mutton and pungent spices for several hours, making it very rich indeed. Of course, Bubur Lambuk (Malay porridge) is also an integral element of iftar meals. A bread basket is provided to go with soup. The basket includes familiar breads such as baguette, country bread, Bengali bread and bread rolls. Located outdoors are several grilling stations where Kambing Panggang (roasted lamb) is cooked. Marinated for several hours, the whole lamb is roasted over burning charcoal to give a sense of toastiness. Flavorful slices of lamb are best enjoyed with Nasi Arab (Arabic rice). There are a handful of homemade condiments to go with lamb. Popular ones are barbecue sauce, black pepper sauce, mushroom sauce and yogurt & mint sauce. For something spicier, sos air asam cili bawang (tamarind, chili and onion sauce) and sos Thai (Thai sauce) are also great with lamb. Back by popular demand, Murtabak Ayam is the main highlight of Vistana's Ramadan buffet. Flour dough is filled with chicken, and then fried on a griddle. Murtabak is often served with dhalca sayur (vegetable gravy) and bawang jeruk (pickled onion). One of Vistana's chefs, Chef Lim, has his award-winning dish on the menu: Asam Laksa. The soup is made from mackerel and is infused with flavorful spices like tamarind and chili peppers. 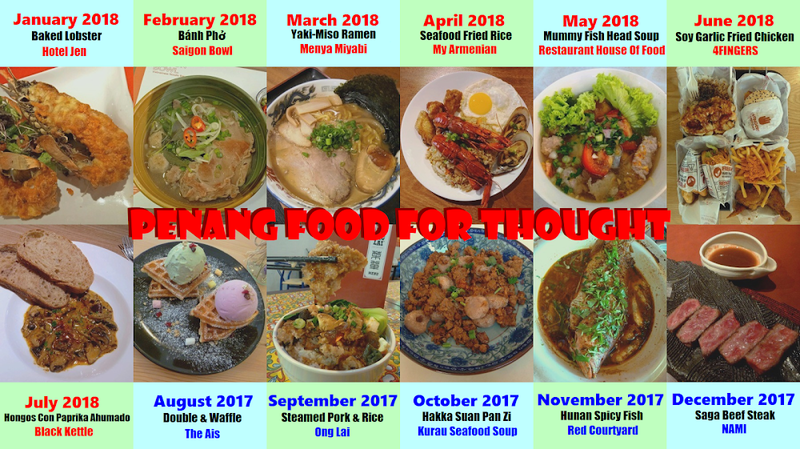 Besides thick rice noodle, other Asam Laksa ingredients are red chili, cili padi (bird's eye chili), pineapples, cucumbers, bunga kantan (ginger flower), onions, lettuce and mint leaves. Belacan (shrimp paste) is optional but most people add it anyway. There is another "warung" (stall) which serves Nasi Ayam (chicken rice). Two types of chicken are prepared: roasted chicken (烤鸡) and boiled chicken (白斩鸡). Oily rice, chili sauce and soup are provided to go with either chicken. Kerang (blood cockles) is a popular Malay delicacy. Raw cockles (with shells intact) are blanched in hot water, then eaten with sambal kicap (chili soy sauce) or sos Thai (Thai sauce). The "bloody" taste of cockles is due to iron content, which I believe is the main appeal of this dish. Another Penang street snack is Rojak Buah (fruit salad). Fruit types include jambu air (rose apple), belimbing (starfruit), sengkuang (jicama), nenas (pineapple) and jambu batu (guava). Fruit pieces are dressed in kuah rojak (rojak sauce), a savory emulsion made from belacan (fermented shrimp paste). Light sprinkles of sesame seeds and crushed peanuts help to improve mouthfeel. As for Ulam-Ulaman (raw vegetables), popular choices are ulam raja (king's salad), daun pegaga (Asiatic pennywort leaves), daun selom (selom leaves), daun kaduk (wild betel leaves), jantung pisang (banana flower) and kacang botol (winged beans). Raw vegetables are usually eaten with powerful condiments like sambal belacan (fermented shrimps), budu (fermented anchovies) and tempoyak (fermented durians). There are 3 types of ikan masin (salted fish): sepat (blue gourami), gelama (soldier croaker) and bulu ayam (moustached thryssa). Other appetizers are telur masin (salted egg), tauhu sumbat (stuffed tofu) and keropok (crackers). Kerabu (Malay salad) is also popular among the Malay community. 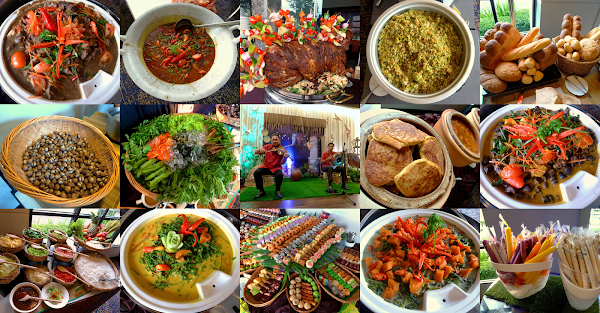 Presented on a wooden boat, the choices are Kerabu Mangga (unripe mango salad), Kerabu Sotong (squid salad), Kerabu Taugeh Kerang (bean sprouts & cockles salad), Kerabu Pucuk Paku (vegetable fern salad) and Kerabu Kacang Botol (winged beans salad). Moving on to rice, ketupat daun palas is glutinous rice wrapped in palm leaf pouches. The rice dumpling is boiled, causing rice to expand and become compressed. Meanwhile, lemang is prepared by filling hollowed bamboo stems with glutinous rice, which are then cooked over fire. Both ketupat and lemang can be eaten with Serunding Ayam (chicken floss). Serunding is similar to Chinese meat floss (肉松) in terms of appearance and texture. Nasi Minyak Hujan Panas is cooked with a complex mixture of spices, making it not only aromatic, but highly delectable too. This dish is named "hujan" (rain) because rice grains are dyed in several colors, resulting in the illusion of rain droplets. When preparing food in a communal setting, it is economical to use a large pot called kawah. An example is Daging Masak Gulai Kawah (beef curry), where beef is cooked in spicy gravy that tantalizes the taste buds. This dish is also loaded with lots of coconut milk for extra creaminess. The recipe for Daging Rendang Tok (spicy beef) is inspired by Minangkabau cuisine. For this meat dish, beef is cooked with a mixture of spices using low fire. Meat is cooked slowly until most of the liquid has boiled away. What remains behind are delicious chunks of beef saturated with savoriness. Kurma Daging Kambing (mutton curry) uses a different type of spice mix that has a distinctive aroma. I must say that the mixture of spices does a great job in suppressing unwanted "odor" that is often associated with mutton. Despite its name, Ayam Masak Ros (rose chicken) does not involve rose flowers. Instead, the name refers to the reddish gravy that is made from tomato sauce and several types of spices. Rendang Itik (spicy duck) uses similar cooking method as its beef counterpart. While duck meat is seldom used for rendang, I still prefer the familiar beef version. Believe it or not, Ayam Goreng DJ (DJ fried chicken) is a recipe from the wife of Tan Sri Yeoh Tiong Lay. Thanks to crispy coating of spices, the deep-fried pieces of chicken are scrumptious indeed. I personally like the Sambal Tumis Udang Petai (sautéed shrimp and stink beans). Small shrimps are cooked with their shells intact, which become edible when cooked. Meanwhile, the distinctive smell of stink beans presents this dish in an appealing manner. Both savory ingredients are brought together using fiery chili paste. Siput Sedut Masak Lemak Cili Api (spicy sea snails in milky gravy) is another exquisite marine delicacy. Sea snails are cooked with their shells intact. To extract a sea snail's flesh from its shell, slurp forcefully from the narrower end of the shell. Unfortunately, I have yet to figure out the perfect method that works every time. Another shellfish dish is Lala Goreng Pedas (spicy fried clams). Heavy seasoning is necessary because these clams are generally tasteless on their own. Pucuk Paku Masak Lemak Kuning (vegetable fern in yellow gravy) is a scrumptious vegetable dish. For this dish, crunchy vegetable fern is cooked in turmeric-based gravy with lots of coconut milk. If you enjoy the sweet taste of ripe pineapples, Pajeri Nenas (Pineapple Curry) should serve you well. Besides fruity sweetness, the curry also carries a hint of tanginess which draws appetite. For something milder, try the Bayam Masak Lemak Putih & Ubi Keledek (amaranth & sweet potato in white gravy). As the name implies, there are two main ingredients: amaranth and sweet potato. This dish is not nearly as spicy as previous ones. Taking a detour to fish, Ikan Keli Goreng Berempah (spicy fried catfish) is served today. Catfish's flesh is quite soft but has lots of tiny bones, so use caution when eating. Also on the subject of fish, Ikan Cencaru Sumbat Sambal (chili-stuffed mackerel) is quite popular too. Mackerel is cut open and is stuffed with delightful chili paste. Mackerel has lots of tiny bones, so be careful not to choke on one. Compared to other Ramadan dinners that I have witnessed so far, Vistana's buffet has an exceptionally large variety of Malay kuih. According to the staff, today's preview merely showcases a "small" sample of what's available during Ramadan. Many of these Malay kuih are sourced from night market vendors whom Vistana has established working relationships over the years. The confectionery section also covers a reasonable selection of Western pastries like cupcakes, tarts and puffs. These items are made in-house by the pastry chefs. Fruit puddings come in several flavors: lychee, honeydew and mango. There is also Bread & Butter Pudding, which is best enjoyed with vanilla sauce. Sago Gula Melaka is a popular local delicacy. Since sago pearls are almost tasteless on their own, they are usually flavored with gula melaka (palm sugar) and coconut milk. Another traditional confectionery is dodol. This sticky candy is made from rice flour, coconut milk and gula melaka. Today's dodol comes in two flavors: coconut and durian. For something more cooling, there are tropical fruits like pineapple, banana, papaya, watermelon and honeydew. Also provided is an array of Jeruk-Jeruk (fruit pickles) such as buah pala (nutmeg), kedondong (ambarella), salak (snake fruit), asam kelubi, mango and papaya. Ais Kacang is one of Malaysia's most popular desserts. Served with shaved ice are attap chee (nipa palm fruit), kacang buah pinggang (kidney beans), cendol (green jelly noodle), cincau (grass jelly), krim jagung (creamed corn) and more. Coconut milk, gula melaka and sirap ros (rose syrup) serve not only as sweeteners, but also to provide aesthetic appeal. Ais Krim Malaysia are sticks of fruit-flavored syrup filled in transparent plastic tubes, which are subsequently frozen. These popsicles used to be very popular in the past when ice cream was not so widespread. As for drinks, diners may quench their thirst with Teh Tarik (pulled milk tea), Nescafe Tarik and cold fruit juices. This evening's festive atmosphere is kept lively by Irama Nada, a two-piece band playing the biola (violin) and rebana (Malay tambourine). Vistana's Ramadan dinner buffet is served from 29 May 2017 to 24 June 2017. 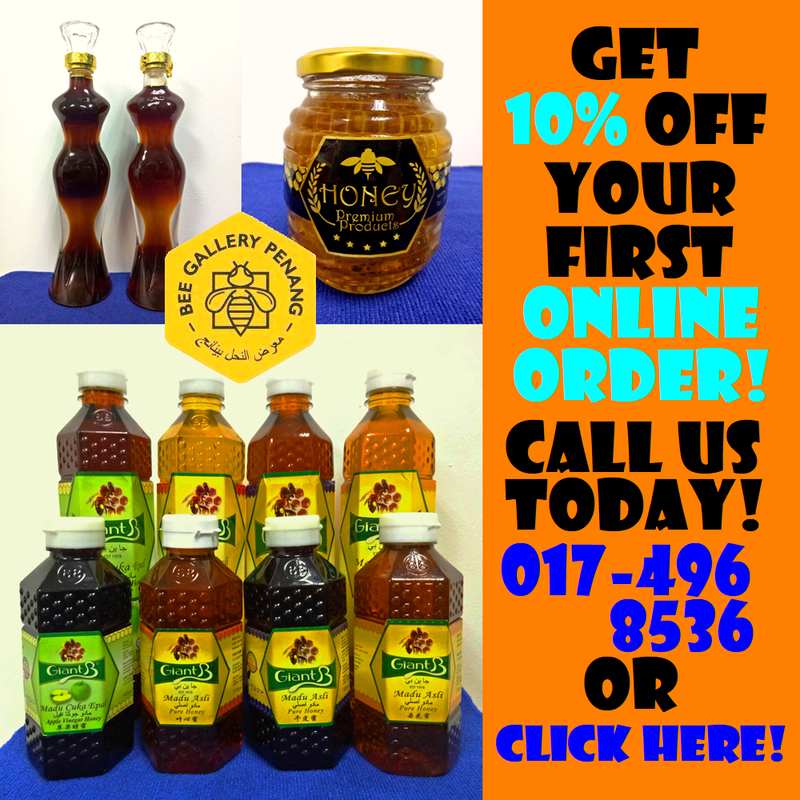 The price is RM70.00 net per adult and RM30.00 net per child (4 to 12 years old). Considering its food variety and relaxing ambience, Vistana's Ramadan promotion truly provides good value for money.